LG G Pad: like a bigger Nexus 7? More rumors about an LG tablet, dubbed the LG G Pad, popped up again when sources came forward claiming they've held the device in their hands. According to the Greek site TechBlog (via PhoneArena), these slippery sources spilled the beans about some of the G Pad's stats. Allegedly, the LG G Pad is an 8.3-inch tablet with an impressive 1920 x 1200 display, putting it in the upper echelons of screen quality. Interestingly, the G Pad was also said to have cell capabilities with support for call-enabled SIM cards. According to the sources, the G Pad (please let it have a different name) is extremely thin and light, with a small side bezel, and fits easily into back pockets - which for an 8.3-inch tablet is nigh unbelievable, so take that with a side of salt. The G Pad reportedly also sports a quad-core processor and 2GB of memory, but that's where the details stop. Overall the G Pad was compared to the Nexus 7, only slightly larger. LG hasn't released a tablet since the Optimus Pad came out years ago, but it was rumored as far back as May this year that the company is getting back into the tablet game. The G Pad name first surfaced last month, when LG filed listings for "G"-branded devices like a G Watch, G Band, G Hub, G Glass, and G Link. The G Pad and G Watch are easy to figure, but whatever the rest of those products are remains a mystery. Thankfully, PhoneArena reported that the G Pad, at least, will be unveiled at IFA 2013 next month, so we may not have to wait much longer to find out. Don't feel like waiting for LG's G Pad? 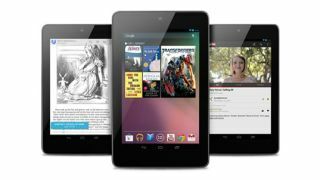 TechRadar ranked the best Android tablets available now.